Soprano Sax, Tenor Sax, Baritone Sax, Ethnic Flutes & Whistles, Synthesizer & Percussion Sequencing at various times on all tracks. CA. with Protools assist by Ashburn Miller. Special Thanks to Ken Kugler for his profound knowledge. Thanks also to all the great musicians, my supportive friends & family, my wife Tracy and all the wonderful animals who inspired me! Writer/arranger/multi-instrumentalist FRANK MACCHIA released one of this writer's favorite discs of 2003 with his Galapagos Suite, and his new ANIMALS (Cacaphony, Inc. 506) is even better. Assisted by a cast of strong players that includes Vinnie Colaiuta, Billy Childs, Grant Geissman, Bruce Fowler, and Mark Isham, Macchia paints sonic portraits of various animals or settings that are rich with melodic and harmonic detail, and as refreshing as iced tea on a sweltering day. Tracks like "Tigers" and "Jungle Forest" display Macchia's extraordinary ear for color, as well as his ability to draw definitive realizations of his scores from the musicians, while "Vultures" and "Snakes" are but two examples of an arranging talent that should be mentioned in the same breath as Gil Evans or Henry Mancini. Macchia takes the closing "Lone Wolf" all by himself, overdubbing nearly 20 different instruments in a stunning demonstration of his skills as a player, writer, and arranger. Memorable music, highly recommended. Each tune on this release expresses the fundamental nature of a particular animal. Although this concept sounds like a cute idea for a kids’ album, there’s nothing childish about the skills and imagination that Frank Macchia brings to Animals. Plug in your headphones, close your eyes, and Macchia has you bouncing with kangaroos, hunting with tigers, and soaring with vultures. Macchia is best known for his film and TV scores, so it’s no surprise that Animals is cinematic in scope. Numerous L.A. jazz luminaries lend their talents, including Mark Isham (trumpet), Vinnie Colaiuta (drums), Billy Childs (piano), Grant Geissman (guitars), and Bruce Fowler (trombone). They help Macchia paint jazz portraits of different species in their habitats. The latter are mostly portrayed by means of woodwinds, synths, and percussion instruments played and overdubbed by the leader. The end product sounds like a cross between a fusion group and an unconventional big band. The first tune, “Dolphins,” flows with liquid ease and features uplifting wordless vocals by Macchia’s wife, Tracy London. On “Gorillas,” a cello evokes the majesty of great beasts while tropical rhythms conjure a jungle setting. “Jaguars” depicts predatory cats with bop tempos and lightning-fast solos by Childs on piano and Macchia on soprano sax. On “Hippos,” baritone horn and tuba emulate the massive waddling creatures. “Alligators” is an ominous jazz-rock creation propelled by Geissman’s guitar and Colauita’s drumming. Animals is very California, but it’s also an exceptional contemporary jazz recording by an inventive composer and arranger who deserves comparisons to Gil Evans and Pat Metheny. After hearing this one, you’ll feel compelled to visit your local zoo. 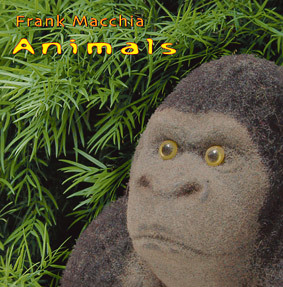 Instrumentalist/composer Frank Macchia has a wonderful new recording out entitled Animals. Joining him are stellar companions, the likes of Grant Geissman, Mark Isham, and Vinnie Colaiuta. Macchia maximizes his talents here, bringing his own experience as a film music composer, arranger, solo artist, and player of all manner of woodwinds, to the forefront. Continuing in the vein of his last outing, Galapagos Suite, Macchia has composed a series of what he calls "musical portraits," with titles such as Dolphins, Camels, Snakes. I would term them "musical evocations." Close your eyes while you listen to Snakes, and you are transported to Snakeworld. Likewise, put on Hippos, and you feel like you're right there splashing around with the big-toothed creatures. Even my dog was spellbound (no pun intended) by this recording. Filing this disc under jazz/world does not do it enough justice. It's more of a musical fantasia, or exotica, along the lines of Ravel or Yma Sumac. There are even some avant-garde symphonic elements that call to mind Stravinsky or Edgard Varese, yet it comes off as accessible as can be. Recommended to music and animal fans of all ages. Funky Zoomeister World and fusion jazz will never be the same with the debut of Animals from composer and instrumentalist Frank Macchia. The album is outrageously energetic and extremely clever. Macchia is an acoustic architect that has created a virtual zoo on thirteen jazzy tracks. After a couple of listens I suddenly realized that Animals is similar to Sergey Prokofiev1s Peter and the Wolf. On Macchia1s modern CD however, each animals has a song instead of being represented by a single instrument. As you listen to the music you can pick out each animal1s theme and you quickly realize that the sound you are hearing is that particular animal in musical terms. Frank is joined on this quirky acoustic ark by some very heavy hitters of the jazz world. Legendary filmscore composer and jazz artist Mark Isham (his Vapor Drawings was a highly influential contemporary album), pianist-composer Billy Childs (His April Touch), rock and jazz drummer Vinnie Colaiuta and fusion guitarist Grant Geissman. The first track is Dolphins. It starts out deceptively simple with a bit of kalimba and melds into a playful Brazilian Bosa Nova track. Childs1 bright piano riffs twinkle on the blue Pacific Ocean as guest vocalist Tracy London1s vocals leap over the waves with grace and energy. Meanwhile back at the zoo there1s a whole lot of hopping going on. The song Kangaroos will have you tapping your toes and bounding around the room. This is the longest cut on the album (8:09) and a great showstopper, but you know those kangaroos, once they get going you can hardly stop them. Great trombone by Bruce Fowler and a terrific lead on the banjo by Grant Geissman. Gorillas is an outstanding track on Animals and one of my favorites. This one is full of surprises. There is an unexpected sense of dignity about the song as we hear what gorillas might be thinking. Macchia's ubiquitous saxophone takes the lead as we follow the noble primate through the dark jungles of Congo, Mbini and Uganda. Like the song, this is one animal that commands respect. The best track on the CD is Tigers. Featuring Mark Isham on trumpet, the song has an incredible driving force that moves forward ever stealthy, ever present. Flutes and piccolos tickle you as you wander though the Cambodian jungle, but finally the music pounces on you with Isham1s dynamic trumpet score. The song asksSare you the prey or the tiger1s plaything? Opening like a Gershwin melody, the final cut, Lone Wolf leaves you with a taste for a hunt for more of Frank Macchia1s music. On Lone Wolf Macchia plays eighteen distinct woodwind and brass instruments, hence the title is a double entendre. The haunting sax prowls the dark music like a hungry beast that can not be satisfied by food alone. The hunt is on for something warm, soft and sensuous. Frank Macchia is an eclectic jazz musician and filmscore composer. A native of San Francisco, California, Macchia headed east in 1976 to attend the prestigious Berklee College of Music in Boston where he studied composition and arranging. He must have been paying attention. In the early nineties he worked as an orchestrator to many films such as X2- X Men United, Men of Honor, and The Contender and he has previously released a CD titled The Galapagos Suite. In addition, Macchia along with his wife, Tracy London has created a successful series of horror stories modeled after the old time radio shows of the 19401s. Overall Macchia1s Spike Jones attitude to jazz and World Music is fun and refreshing. Every cut on the album offers an energetic, creative and funky insight to our friends at the zoo. I had fun just listening. Hand me that bag of popcorn. This is quite the interesting CD project in that the animal kingdom is portrayed through composer Frank Macchia's original music. One will always wonder about the creative forces contained within the soul & spirit of our beloved human race. I assert Macchia's musical efforts rallies to that eternal call succinctly. Macchia offers us music with a different bent as it were, but certainly music with expressions of 'order.' I might add that as he constructs his themes through his material, we the listener consciously work out his material & soundscapes easily, & by default, we become a receptive & attentive audience. Is this not the way it should be? Power of the singular will Free the Subversives first met Frank Macchia when he commandeered a secret meeting outside San Francisco with animal chants (pre-Berklee). Our group of musical clerics then conspired to infiltrate a small but highly respectable business as assistants to the assistant zookeeper. On Saturday, November 16, 1974, 'Franky' and me stole the key, and Free the Subversives liberated the animals. Animals is Frank1s soundtrack to that owl operation. This review is our collective1s ideological 'coming out.' (Billy Childs, David Carpenter and VinnieColaiuta, however, loved all animals, so they formed the rhythms by which all creatures function. Some jazz players cannot be tamed). 3Dolphins2 belong in Florida1scoastal waters. Tracy London chanted to the swimming dual voice-instrumental by which the exotic fish explore aquamarine worlds. Childs' richly textured keys broke the rhythm fixation laid down by Colaiuta, and the fishes exerted their wills with glowing resonance. 3Kangaroos2 never could assimilate in America, sowe bounced them back to their Australian roots. The rhythm trio grooved big-time. Brother Bruce Fowler had been forever changed by his early exposure to a curious kanga from the high end of the bass-ic country; therefore, his trombone work emulated a hopper with highly vocal style. During The Liberation, Grant Geissman clung with the force of his banjo to a jumper1s tail. Here, he hits individual notes hard enough to snap the strings while buzzing (like a bee, no less) over Dionysian-like arpeggios. Brother Macchia, inspired by Geissman's exploration, combusted into a saxophone scream to the wilderness. If there was ever an animal that deserved to be free, the modern kangaroo was it. 3Tigers2 are very deceptive and, therefore, difficult to move safely. We had to utilize special skills. As the cats trained their seemingly empty eyes, and large claws, on the approaching hordes, Brother Mark Isham serenaded them to sedition with his singular horn style. Isham, boy is he good. Alas, the felines became obstreperous inside of 180 seconds and the rhythm section picked up the pace While Isham climbed slick arpeggios, Brothers Alex Iles and Ken Kugler united for harmonic trombone on the low end. The trio united in crescendo and, before we could bleed, the kitties were freed. Brothers Isham, Iles and Kugler massaged the insubordinates beyond our nocturnal senses. 'Gorillas' only respond to primal dance so percussion was instrumental. Brother Scott Breadman concocted a highly intelligent blend of congas, timbales and cuica to get the apes in the mood. Our band of liberators used irregular melodic phrasing, augmented by Sister Stefanie Fife1s deployment of cello (to get the monkeys off our backs). Frank Macchia1s leading-edge improvisation practically muted the apes, their lower lips pouting forward in mesmerized wonder. Brother Breadman hit the percussion to accentuate the allure of alternate climes while the other players repeated the melodic refrain. By the time we finished, the primates wanted little more to do with humanity. The 'Jaguars' missed the night's greatest moments. Before Brother Macchia could unload his orchestral sounds, the cats were gone (tails pointed skyward). With jaguar cages empty, the rhythm section graduated to accomplished composition so that we all danced and praised the cause. Brother Childs laid down such piano chords that arpeggios dazzled the remaining creatures (caged as they were). Brother Macchia1s oscillated notes made saxophone philosophically understood by the bobbing heads - human and otherwise. Brothers Colaiuta and Carpenter generated such glorious bass that all of us began to bang on the cages like Neanderthals. Incredibly, the creatures followed suit. Anarchy was imminent. We thought the spirits of the forest were taunting our civilization. Frank assures us that 'Jungleforest' was the cerebral musical recreation of his mind. It was 1974. 'Camels' need ethno-centric sounds. Brother Geissman said he once tried the electric sitar, so we rented one. As he played Middle Eastern lines, we triggered his pre-recorded 6-string electric bass. Brother Breadman again chipped in with acoustic percussion. You should have seen the camels1 eyes! They thought they were back in Arabia. Inside of 64 bars, they stretched as far as they could and rose as a species united. Brother Colaiuta was careful to keep the drum part consistently irregular, and the hump-backed hoofers lurched beyond the gates. 'Hippos' need a combination of low-end sounds and repetitive rhythms. Brothers Colaiuta and Macchia wisely retained the pedestrian tempo, and its domino effect eventually animated the hippos. Brothers Iles and Kugler threw in some harmonized, syncopated baritone horn and tuba to further seduce the horny creatures. The International Brotherhood to Free the Subversives (I.B.F.S.) had previously urged us to sprinkle the remaining music with all kinds of syncopation. We executed in fine style. Slither like 'Snakes,' and you have it made. Brother Macchia coordinated the dazzling, hypnotic orchestral combination of Sister Valerie King1s piccolo and bass flute. Brother Breadman offered to shake ('That'll rattle Œem,' said he). Sister King's temperate and sensitive playing charmed the skinoff the pythons. They love arpeggios, who knew? 'Alligators' get pretty snappy around people, so Frank suggested a more simplistic rhythm with ominous, malignant- sounding spatial stuff on the high end. The jaws started gaping, so we went into emergency mode: Brother Geissman frantically conjured as much guitar largesse as his remaining hand could muster. Brother Macchia put it cleanly through a Marshall stack so Geissman could appeal to the gator1s rock sensibility. A 21-footer walked up to Geissman and opened wide. Grant regressed to thundering Black Sabbath riffs, but the croc retreated (3Hey, if it works,' he would recall some 30 years later). We were happy to see the back of the alligators. From the swamp to the air, 'Vultures' was all about space. Freedom is for the birds, so Free the Subversives reverted to cunning spatial music. Brother Wayne Bergeron1s flugelhorn sang to spectacular off-timed rhetorical effect. Brother Colaiuta subdivided the underlying rhythm with chorded trombone support. The mandate climaxed on the wings of freedom. The 'Lone Wolf' was left. Dirk got up and began to nuzzle up against members of Free the Subversives like a puppy-dog. Several of us began to tear up - happens every time. We rubbed the back of Dirk1s ears while Brother Macchia serenaded the moonlight. A short, stout university professor, some new recruit, asked: 3should we domesticate the animal?2 As a heated debate ensued, the lone wolf eyed us with sentiment like a soul in deep need of companionship. We had to gently nudge his mug towards the forest, assuring him that the jungle was best. Revolution can take a lot of Kleenex. Animals, as it turns out, is a landmark aural depiction of yesteryear's Free the Animals campaign, courtesy of what Frank1s microphone picked up that fateful night. Animals and people in harmony: liberal democracy. Frank Macchia, 'Franky' as we remember him, has gone on to other richly successful campaigns. Without the collective, however, any cause is mute. If you believe in free creatures, support the Animals.